The answer to providing broadband for all could lie in the skies with balloons offering a new way to deliver fast internet services. It has long been assumed that affordable, high-speed broadband to every area of the UK was only possible via road-disrupting cable laying or expensive satellite connections. But a company called SkyLinc has found a happy medium in base stations, floating 1.5km above the surface of the Earth on balloons, or tethered aerostats as they are more technically known. The York-based firm has tested the technology and found that it works well. SkyLinc's Libra (Low Cost Integrated Broadband Radio Access) system offers a solution to the age-old problem of how to get broadband out affordably to the whole of the UK. Just 18 base stations would provide total UK coverage, from densely populated towns to the remotest cottage in the Scottish Highlands. The system works by floating a helium-filled envelope in the air, which is held stationary and fed signals via a fibre optic pole. Such a system would offer net access at more than double the speed of most broadband services currently available. What is more, it is would not slow down as more and more people use the service which is the case with DSL - broadband via the phone line. For people interested in uploading as well as downloading, it will provide the same speeds in both directions. Problems such as bad weather conditions can be countered by an antenna stabilisation system which would make sure the antenna stays in place regardless of wind, rain or other conditions. The technology behind the idea has been around for years, with the US Government operating several such aerostats as communication systems on its borders and the US military employing similar technology for about 50 years. 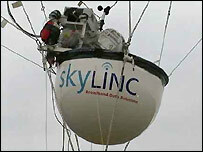 SkyLinc has been talking to a variety of internet service providers about introducing such a system and is hopeful that it will have commercial contracts in the next year. "There is a market reticence about investing in telecoms companies following the dotcom bust but if it doesn't happen in the UK it will happen somewhere else," said Matt Hobby, a technical engineer at SkyLinc. Initially the system is seen as most suitable for small businesses, and promises to be a tenth of the cost of leased lines which are often employed to provide high-speed access to firms. But in the future, the technology is likely to come down in price and be available to consumers as well, said Mr Hobby. "We envisage it as offering true broadband across the country, no matter who you are or where you live," he said. Communities in remoter areas of the UK are already taking advantage of wireless technology and sharing out costs among themselves and SkyLinc sees no reason why they should not be able to take advantage of the airborne broadband system. 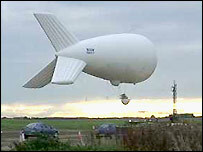 Licenses for the aerostats need to be obtained from the Aviation Authority and SkyLinc currently has two approved sites in Yorkshire. The idea of airborne broadband is gaining ground although Professor Jim Norton, the Cabinet Office's former director of e-commerce, said it could be between five and 10 years before such solutions become commercial reality. "It is quite feasible but has to overcome the attitude in telecommunications that things have been done a certain way of 20 years and have to been done the same way for the next 20 years," he said. If and when such a solution comes along, it could provide an answer to the problem of rural broadband as well as shooting BT's business model "out of the water" said Professor Norton.